Risotto is one of those things that I just don’t make at home. I’ve made it for work many times…but it just seems too "labor intensive" for casual home cooking, which is silly. More often than not, the risottos I’ve eaten have all been in restaurants. To justify taking the time to cook it at home for dinner, I recruited my friend Alex and we gave it a go. 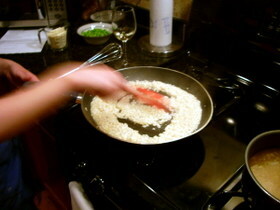 Truth be told, this risotto thing couldn’t be easier. The kicker is that there is a lot of stirring. When I say a lot, I mean a lot…and a lot really means constant. Other than that, it’s easy peasy. Alex taking his turn as blog guest star – or guest-stirrer, as the case may be. 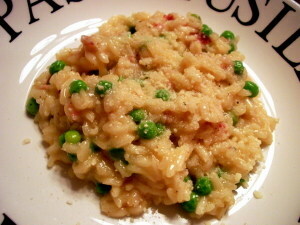 I found the recipe that we used – Risotto with Peas and Prosciutto – on Epicurious. While the recipe was delicious and really used the ingredients well, we both concurred that there was something missing. More lemon zest? More onion? We had this an entree unaccompanied by anything else. I think it would be great with some grilled or sauteed shrimp to give the risotto some added sweetness. Cook onion in 2 tablespoons butter in a 3 to 4 quart heavy saucepan over moderate heat, stirring occasionally, until softened, 3 to 4 minutes. Add rice and cook, stirring, 1 minute. Add wine and simmer, stirring, until absorbed. Stir in 1 cup simmering broth and cooking at a strong simmer, stirring constantly, until broth is absorbed. Continue simmering risotto and adding broth, about 1/2 cup at a time, stirring constantly and letting each addition become absorbed before adding next, until rice is just tender and creamy but al dente, 18 to 20 minutes. There will be leftover broth. Stir in peas, prosciutto, zest, 2/3 cup cheese, parsley, remaining 2 tablespoons butter, and salt and pepper to taste. If necessary, thin risotto with some of the remaining broth. Serve immediately with remaining 1/3 cup cheese. I had the same problem when once I made risotto, but this recipe looks great; I don’t know what I would change, either. Yum…. Another good one Tami. You are a keeper. I know what you mean about labour intesive. I’ll be the first one to order a risotto out, but I blanch when someone suggests I just make my own. Much more fun to enjoy the wine and conversation before it is served! Great recipe! The only one I”ve had is served down the street from my work. It’s delicious, and they take the seafood route with blackened shrimp, scallops and calamari in it. I so TOTALLY hear you about your recent DSL loss. In our middleof-nowhere village here our wireless tower was fried by lightning. And when you have only one guy in town who remotely has the skills for it, it takes a while to fix. Tami – try (aged)carnaroli next time. 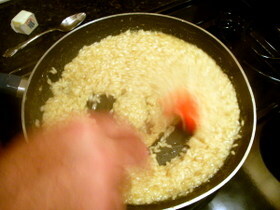 I make risotto all the time and have found that carnaroli gives a firmer, less gummy risotto. Leftover is actually edible the next day. I think your missing ingredient is shallots. To me, onions are too bland for risotto. I don’t know what the deal with shallots and rice is, but they seem to draw out the individual flavors of the veggies, resulting in a saltimbocca-like zing that makes your skin crawl (in a good way). I’d trying substituting 5 or 6 shallots for the onion next time. You said you thought there was something missing in the risotto you made … I make risotto at home often and I substitute chopped fennel for the onion in most recipes (my family doesn’t love onions so I find alternates if I can) The fennel mellows and imparts a wonderful flavor to the risotto. I use the pea and procuitto recipe you did as well as various others including one with butternut squash and a little fried sage on top both taste great with the fennel.